The Task Force on Land Supply has highlighted how we face two paramount housing shortage problems: exceptionally expensive purchase prices for those wanting to buy to live; and shockingly long waiting lists for public-housing applicants. Many agree that the dominant cause of this distress today is the shortage of land on which to build. In this article I do not wish to enter the thorny debate on how to alleviate this building land shortage. My aim is to examine one pivotal factor that has, since 1842, constrained the release of land for building in Hong Kong. As it happens, it is also a factor with an often overlooked, distinctive upside. British-ruled Hong Kong was meant to be made financially self-sufficient, from the beginning, by the sale of a government retail opium monopoly (copying the model used earlier in British-ruled Singapore). The British also introduced a land tenure system on Hong Kong Island from 1842 that proved to be a first-rate revenue source. The government sold all land as leasehold rather than freehold. Even more significant, each new government lease stipulated just what building was allowed. The opium-based public revenue system was a washout for some decades but the opium trade fueled vigorous economic growth in Hong Kong which, in turn, drove up demand for land. Fairly soon, leaseholders of all stripes - commercial and residential - found themselves able to improve by rebuilding. In order to vary the lease-stipulated building permitted, however, they needed to have the relevant lease amended; a lease premium had to be paid to the government to secure any such change. Primarily relying on the land revenue system, the new Hong Kong government established strong fiscal foundations quite swiftly. Within about 40 years, it was so fiscally sound that it had banked a surplus sufficient to cover all expenditure for around one year. The government, as fundamental land provider, found several policy parameters falling into place, based on this experience. Thus, it made sense to exclude much land (often hilly) from building, all the better to push up the price of land earmarked to be leased. This policy also encouraged regular occupied land redevelopment, which continually augmented the lease-premium income stream. The same basic system remains intact to this day. It provides the most important explanation of how it comes to be that Hong Kong has restricted high density development to about 30 percent of its total area. This 19th century policy has also, though, been a key factor shaping Hong Kong's evolved accommodation land shortfall - remedies for which the Task Force on Land Supply is now investigating. So what is the upside? Apart from low taxes and more close-by, surrounding greenery than any other city of its size, there are two other vital benefits we enjoy which have been underwritten by this distinctive land revenue system: the rule of law and Hong Kong's remarkable comparative social stability. Robust and effective judicial, legal and policing systems are expensive to establish and maintain if they are going to serve all in a community with some level of steady fairness. 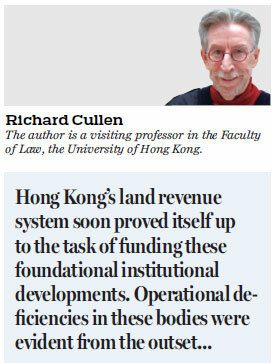 Hong Kong's land revenue system soon proved itself up to the task of funding these foundational institutional developments. Operational deficiencies in these bodies were evident from the outset and some remain today. Comparatively, however, Hong Kong has built - and funded - an enviable rule of law system. But what of that benchmark social stability? Hong Kong experienced seriously rapid population growth after World War II as a result of migration from the Chinese mainland. Once the government grasped the reality of what was happening, they engaged in one of the most successful, massive rehousing programs seen anywhere. Due to that outstanding land use policy, dating back more than 100 years, the government had the funds already saved to build new, basic housing on a vast scale. Moreover, because of its frugal habits in releasing land for development, it had, at that time, a massive land bank available on which to build all this new housing. Decent shelter is the backbone of civilization. The stabilizing impact of this vast uplift in public housing cannot be overstated. It has given the widest range of Hong Kong residents access to basic, adequate accommodation. So many hard-working families have been able to build for a better future in consequence. We are still confronted today with the awful accommodation shortfalls noted above. We should not forget, though, that the same exceptional land policy which has constrained land release in Hong Kong has left our high-density areas surrounded by nearby greenery. Still more importantly, it has bankrolled our rule of law achievements and some world-beating basic housing policies. These two successes have underpinned so much Hong Kong has accomplished. They are achievements we can rightly be proud of.